Why does my product show as having zero (or negative) stock available? If you’ve just set up a product in Current RMS and it’s showing as having no stock available throughout the system, you may need to check you’ve set up your stock level correctly. Does your product have a stock level? Stock levels are the physical units of a product. Other than non-stock products, each product in your system should normally be set up with a stock level that tells Current how many of that particular product you have. To check your stock levels, go to your product’s page and take a look at the ‘Stock Levels’ section on the left-hand side. If you’ve got stock levels set up, you’ll see either a quantity held (for bulk stock), or a list of asset numbers (for serialised stock). To add a stock level, click ‘add a new stock level’ at the bottom-right hand side of the ‘Stock Levels’ section. What’s the effective date on the stock level? If you’ve got stock levels set up and the picker still informs you that you have 0 items available, check the effective date on any stock levels you’ve set up. The effective date is the date when the stock is available from. 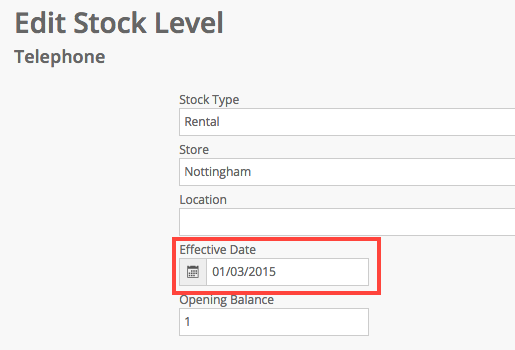 If you’re trying to add items to an opportunity with a date before the effective date of the stock level, Current will tell you that you don’t have any stock available. To check the effective date, go to your product’s page and scroll down to the ‘Stock Levels’ section. Click the blue drop-down arrow to the right of a stock level and choose ‘edit’. On this screen, you can modify the effective date so it’s before the date of the opportunity you’re trying to create. Are you in the correct store? You can set up multiple stores on your Current RMS system. Each store shares your People & Organizations, activities, and products, but has its own stock levels and opportunities. If you switch stores, you’ll see stock availability for that store. To switch stores, click the blue link under your name at the top-right of the screen. To check which store an opportunity belongs to, open the opportunity and click the edit button (the pencil icon) at the top. The store should be listed towards the bottom of this page. You can choose which store is associated with an opportunity when you create it. Have you checked the availability screens? 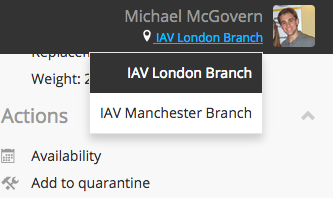 The availability screens can tell you exactly where your stock is and the status of it. It’s worth checking your availability screens as you’ll be able to see if your product is on an open-ended rental or in post-rent unavailability. To get to the availability screen for a particular product, go to the product’s page and click ‘Availability’ under Actions on the right. If you're still having trouble, contact a friendly Product Specialist by emailing help@current-rms.com or by using the green help bubble at the bottom right-hand corner of every page of Current RMS.